Ankara has nine vast shopping malls, including one at the base of the 125-metre (410 ft) Atakule Tower, a communications mast that houses a glitzy revolving restaurant. Sevilla Revolving Restaurant, Atakule Tower, Çankaya Mh. Çankaya Cd. Çankaya Ankara, Turkey 06680. Closed. Dome Restaurant, Atakule Tower Çanyaka, above Sevilla. Unbeatable panoramic view of Ankara. Non revolving. UFO Cafe, Atakule Tower. Cafe also below Sevilla. Roka Balik, Gerisalti Mevkii Cokertme Cad. 109, Yalikavak Turkey 48153. +90 25 2385 2030 Rooftop bar and restaurant. Beautiful sea view. 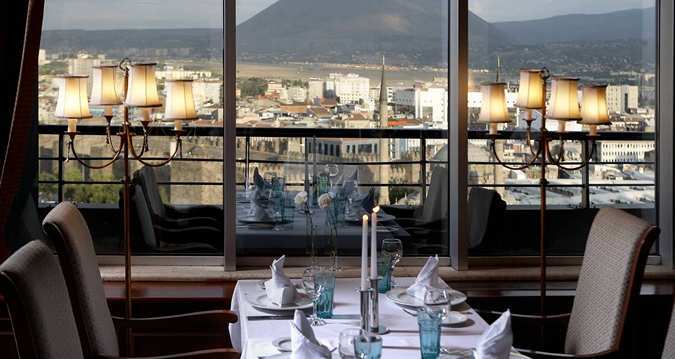 Kervansaray Rooftop Restaurant, 1015 Musalla Mah Sokak 5, Cesme, Cesme (Izmir) 35930. Al fresco dining overlooking the harbour and the new marina. The Roof top Terrace Pool, Kervansaray Bursa Hotel, Doganbey Mah, Fevzi Çakmak Cad 31, Tayakadin, 16220 Bursa- smangazi. Ph 133 810 Spectacular dining options are the speciality. The Roof top Terrace Pool features amazing views of Bursa that really must be experienced. The hotel is located opposite the Marina and the breakfast roof terrace has a splendid view. Gironda Restaurant Yaliboyu Mah. 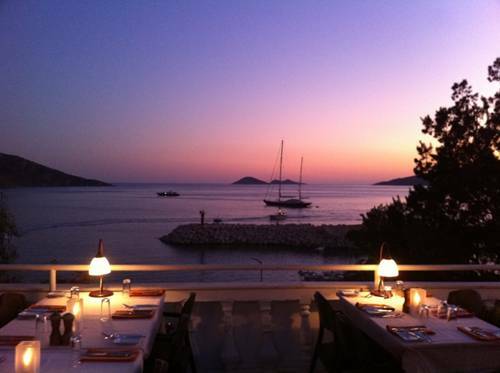 No:28 Kalkan, Kas, Kalkan, Türkiye is expensive but has a nice romantic atmosphere with a grand piano to boot. Gironda sits high above the rooftops and has, as a result, one of the most splendid views of all the restaurants in the village. Hotel Zinbad, 26 Mustafa Kocakaya Caddesi, Kalkan, 07960. +90 24 2844 3475 Tiled stairs lead up to a rooftop terrace decorated with bamboo. The terrace commands views of the harbor and the slender minaret of the mosque to enjoy while dining. Tekinberk Hotel, 31 Kalamar Caddesi, Kalkan 07960, Turkey. The rooftop restaurant is great for breakfast, with spectacular views of the harbour. Oasis Hotel. 22 Cumhuriyet Cad. , Kalkan 07960, Turkey. Rooftop terrace with stunning views of the harbor. Kaya is also a reasonable price, has Kadir a great magician and is slightly out of town. Meldi Hotel, Yali boyu mah. 25 Nilüfer sok. Kalkan. 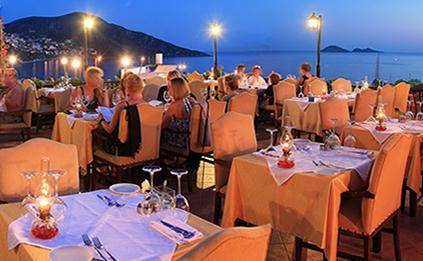 A terrace restaurant with a wonderful view of Kalkan for A La Carte dining. A pool side restaurant for snack and lunch. Zeytinlik Restaurant (Olive Garden), Old Town, Kalkan, Turkey. +90 242 844 3408. +90 242 844 2820. Views from the second, higher terrace are fantastic. The Rooftop Fish Terrace, Patara Stone House, +90 242 844 3076 The views of Kalkan bay and the beach are breathtakingly beautiful and uninterrupted. Kale Mah, 16 Ataturk Caddesi, Pamukkale, Turkey. Enjoy a day relaxing on their spectacular roof-top terrace with its breathtaking panoramic views. Beyaz Kale, Menderes Caddesi, Rooftop restaurant. Hotel Bella, Ataturk Mah, 7 St. Johns St., Selcuk, Turkey 35920. (closest town to the ruins). +90 232 892 3944 Have lunch on the rooftop balcony. It has views of the St. John Basilica.